It is well known that natural products are valuable resources for drug discovery and development. In particular, plant-derived natural products have greatly contributed to the area of cancer chemotherapeutics. Many antitumor drugs currently in clinical use, such as paclitaxel, vinca alkaloids (vinblastine and vincristine), podophyllotoxin analogues (etoposide and teniposide), and topotecan (camptothecin analog) are based on natural plants. According to a report, 83% of new chemical entities identified as anticancer agents from 1981 to 2014 were derived from natural products. In the late 1980s and 1990s, the Natural Products Branch (NPB) of the U.S. National Cancer Institute (NCI, Frederick, MD) supported the collection of ca. 80,000 plant samples from tropical areas in the Americas, Africa, and Southeast Asia. Extracts from ca. 3,000 species displayed significant antiproliferative activities at a concentration of 20 μg/mL and 70% of these active species originated from either rainforests or their adjacent areas. Despite the importance of rainforest plants for drug discovery, unfortunately these valuable regions are declining due to climate change, and industrial and economic development, resulting in an extinction crisis for many plant species. The rainforest plant Alangium longiflorum Merr. (Cornaceae) is threatened with extinction and currently on the Red List of Threatened Species created by the International Union for Conservation of Nature and Natural Resources (IUCN). A crude organic extract from the leaves of A. longiflorum displayed broad cytotoxicity with more specific antiproliferative effects against the growth of leukemic cell lines in the NCI-60 human tumor cell line panel. A collaborative phytochemical and biological study on this extract as a resource of anticancer leads was conducted by a research group at Kanazawa University and the NPB of the NCI. A 50% CH3OH/CH2Cl2 extract of the leaves of A. longiflorum (NCI-N33539) was fractionated with EtOAc and water to provide EtOAc- and water-soluble fractions. The EtOAc-soluble fraction was separated by a combination of various chromatography techniques to afford three new compounds, 8-hydroxytubulosine (1), 2'-O-trans-sinapoylisoalangiside (2), and a lupane-type triterpenoid (3), as well as 14 known compounds including 8 alangisides, 9-demethyltubulosine, ankorine, ?-tocopherylquinone, loganic acid, methyl pheophorbide a, and pheophytin a. The structures of all isolated compounds were characterized on the basis of extensive 1D and 2D NMR, HRMS analyses, and comparison of the reported data in the case of known compounds. Selected compounds were primarily evaluated for their antiproliferative activities against five human tumor cell lines including lung carcinoma (A549), triple-negative breast cancer (MDA-MB-231), estrogen receptor-positive and HER2-negative breast cancer (MCF-7), as well as HeLa (cervical carcinoma)-derived (KB) and its multidrug-resistant (MDR) subline (KB-VIN). A new alkaloid 1 and the related known compound 9-demethyltubulosine exhibited significant antiproliferative activities at submicromolar levels against all chemosensitive cell lines, while the MDR cell line KB-VIN was resistant against 1 and 9-demethyltubulosine. The result from NCI-60 panel screening also demonstrated that 1 showed broad spectrum antiproliferative activities at the submicromolar level against most tumor types derived from the breast, central nervous system, leukemia, melanoma, non-small cell lung, ovary, prostate, and renal cells except for the adriamycin-resistant ovarian tumor cell line showing the MDR phenotype (NCI/ADR-RES) and HCT-15, both of which express drug transporter(s). Flow cytometric analysis implied that compound 1 showed no significant effects on cell cycle progression in MDA-MB-231 cells, even at 10-fold the IC50 concentration, while sub-G1 cells accumulated dramatically after 48 h of treatment. These results indicated that compound 1 induced apoptosis in a time- and dose-dependent manner. Plants have been the first source of medicines and serve as a major resource of modern drugs to date. Surprisingly, ca. 90% of higher plants have still not been subjected to phytochemical investigation. 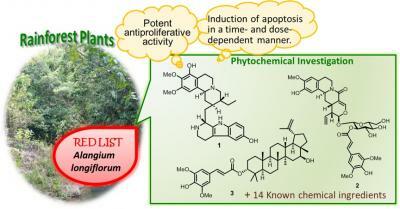 Rainforests can supply rich and diverse plants that are expected to be valuable resources for the discovery of bioactive novel natural products with unique phytochemical properties as drug candidates. We will continue to work to identify novel bioactive natural products from rainforest plants through our collaboration with the NCI.